I sort of understand how first time experiences can leave such indelible marks on our lives. I guess you know that already, well, I do too, but a few days ago I was reminded. I love the excitement of trying things out for the first time, first kiss, first party, first sleep over, first time to zipline and more. But nothing keeps my blood alive even more when trying out a restaurant, either new and old for the first time. With that said, let me tell you a delightful meal I shared with other foodies. Though not my first time to savor Japanese cuisine or a katsu house, it was my first time to try out this franchised outlet from Tokyo. Thanks Raintree Restaurants for bringing a jewel from Japan. 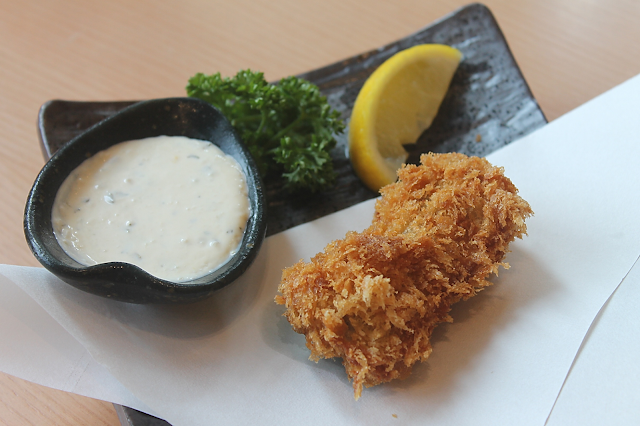 Saboten Japanese Cutlet is a boutique-styled bistro with ample Japanese inspiration. 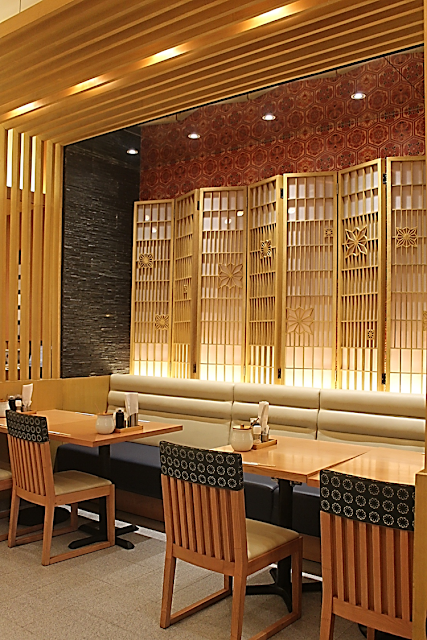 In 1966, Saboten came in the food scene as it opened its first ever branch in Shinjuku, Tokyo, and now have grown to be a worldwide favorite brand for choice katsus with 500 outlets in Japan, Korea, Taiwan, Thailand, Singapore, Hong Kong, Canada, China and Philippines. I'm not fascinated with the idea of it being a franchise, however, I was smitten by the Japanese interior and all the details put into the store making it one of my favorite contempo Japanese designed resto. 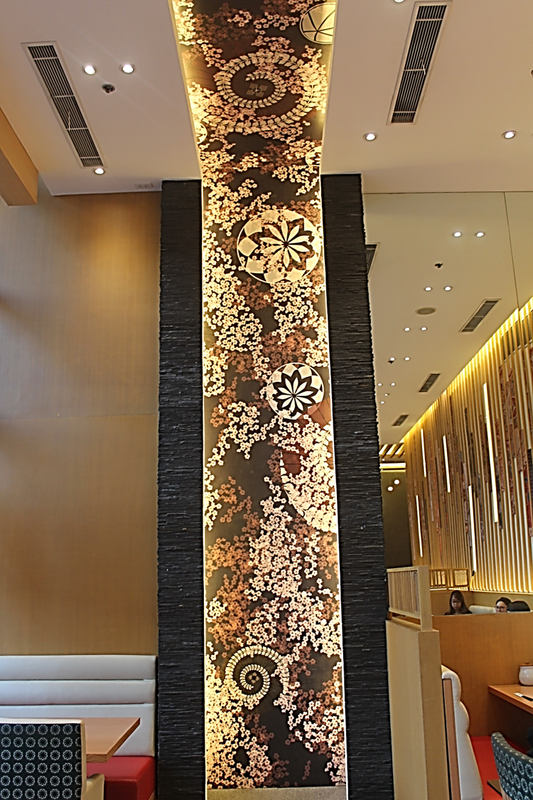 I was instantly drawn to this Sakura-inspired wall décor, as I entered and was led to our table. It was like a giant ribbon trimmed around the room, making the resto a gigantic gift in itself that has gone through meticulous gift-wrapping, the modern-Japanese way. With two branches in Manila, the one which I visited, Glorietta 5, Makati and one at Serendra, BGC, Saboten is getting really good reviews and rating. 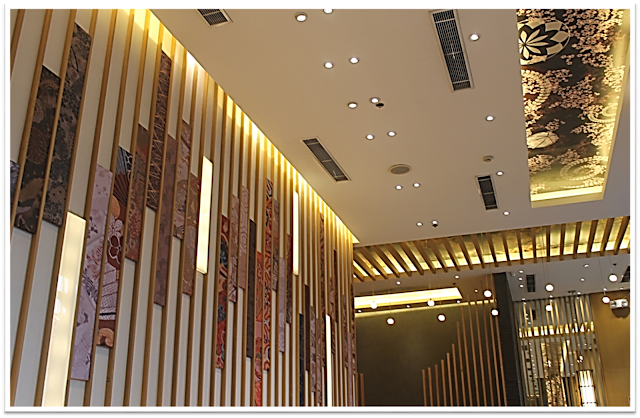 In fact, the Glorietta branch has reached a high total rating of 4.9 out of 5 from Zomato Foodie reviews. As much as I would want to expound on the high praises for this Tonkatsu house, I'll proceed into the succinct details of my first try of Raintree's take on Japanese cuisine, with their newest offering, said to be served only for a limited time. For appetizer, we began with something that was recently added to the menu and something that is usually ordered by diners. To open up your palate for the Tonkatsu feast, it is advisable to begin with Japanese fave, Maguro Tsukudani (P 120). Tsukudani is a way of preserving a fish by cooking in claypot with a sweet-salty sauce. Aside from the Tsukudani, together with some other foodies, we tried Sweet and Sour Chicken Nanban Set (P 475). This one I just had a bite, since I'm waiting for something that really got me to come here. Chicken parts where battered, deep-fried until the skins blister to crisp. A sweet and sour glaze was drizzled on it livening up the already flavorful fried chicken. A plate is served with ample shredded cabbage and bell pepper and aioli dip. 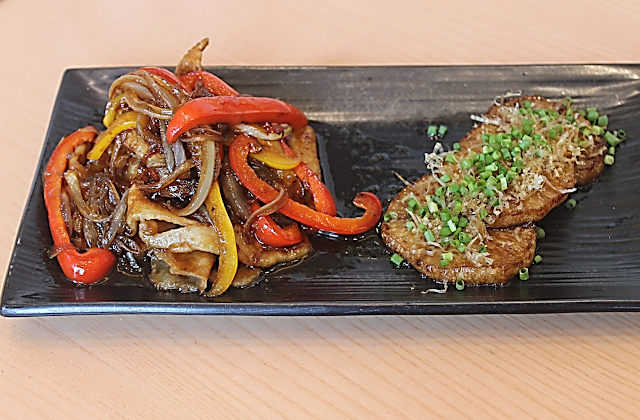 Another new dish from Saboten is the Ginger Pork Shogayaki with Sweet Raddish Steak Set (P 495). I wouldn't mind the price if I were you, a serving can be shared by two. Mind you, this one, order as many rice as you want, as you may want to finish up the sauce. Shoga, a Japanese term for spicy ginger flavor is mixed with soy sauce giving the dish enough saltiness and the sweetness of Mirin gives it a different level of taste. The pork loin was thinly sliced and fried just right leaving it soft and tender to the bite. Served with battered sliced radish that is smothered with sweet and tangy sauce and chopped spring onions. Before I continue to the last addition to the menu, I want to share what I had to gush everything down. 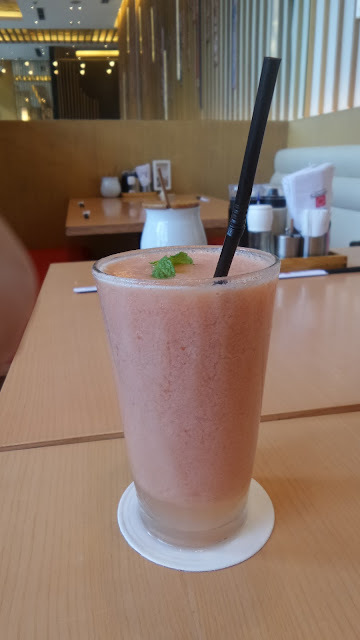 Thumbs up to Raintree for always coming up with refreshingly healthy beverages and smoothies that truly complete one heck of a meal. 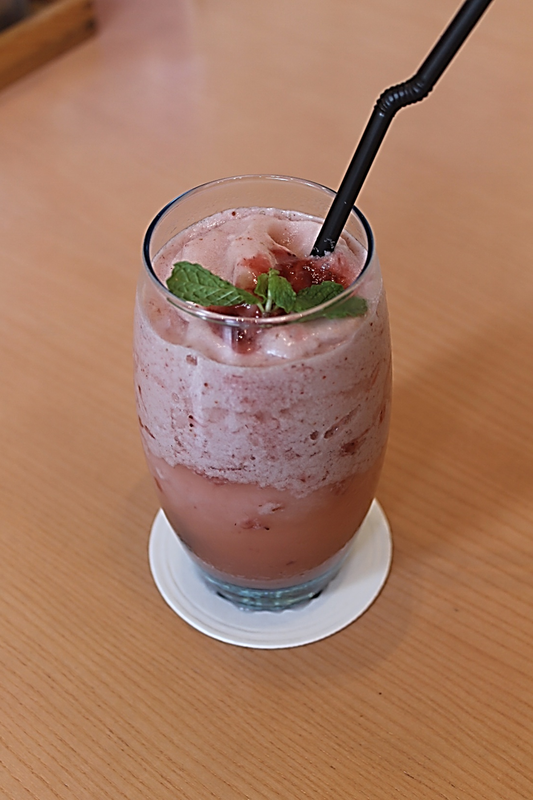 Above is a beautifully glassed strawberry smoothie. That one's for Mish of Mishrendon,com. Mine is this Four Seasons with Yakult. One of the best decision I had that day, it didn't disappoint. The Yakult did not overpower the flavor of the juice, in fact it intermixed perfectly and I just had to contain myself sipping too much before I get to the oysters. Speaking of the devil...Did I tell you I'm a sucker for oysters? Freshly shucked, baked, mixed in pasta, or however it's prepared, I'm ready for it. It somehow got me excited hearing that they have an Oyster Katsu Set. It's funny, katsu means cutlet, but somehow how we (Filipinos) see it is just different. 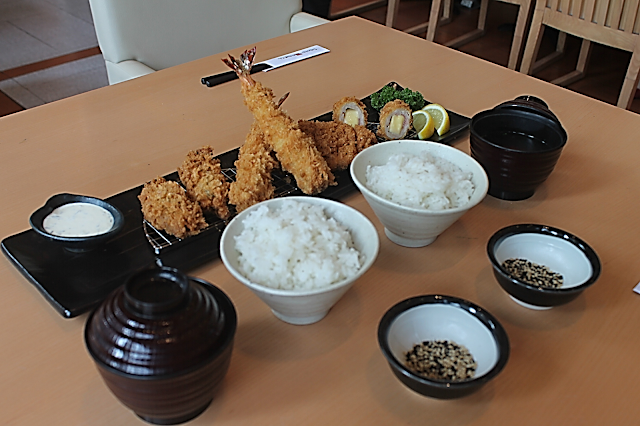 So long as a meat is covered with panko (Japanese breadcrumbs), deep-fried and served with ponzu, that's katsu. Going back to savoring the katsu-dized oysters...it was pretty awesome. What you get is an outer layer that is similar to the best katsu, while inside, the oyster stays juicy and tender, with a bit of creaminess. 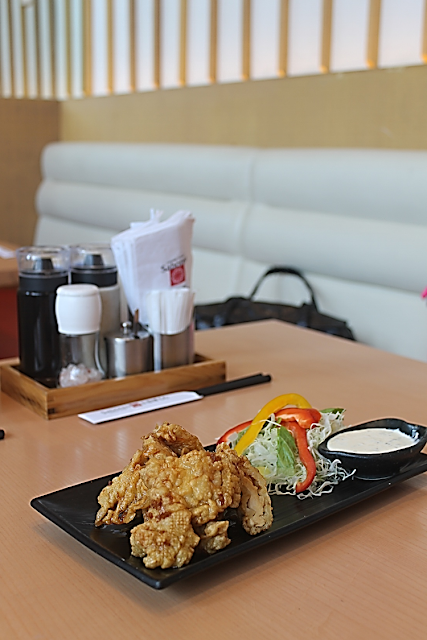 An a la carte order (P 195) has an aioli dipping and has two giant oysters imported from Hiroshima Japan. You may want to dab a drop of lemon juice on it to give it a kick. Same set only taken with my phone. 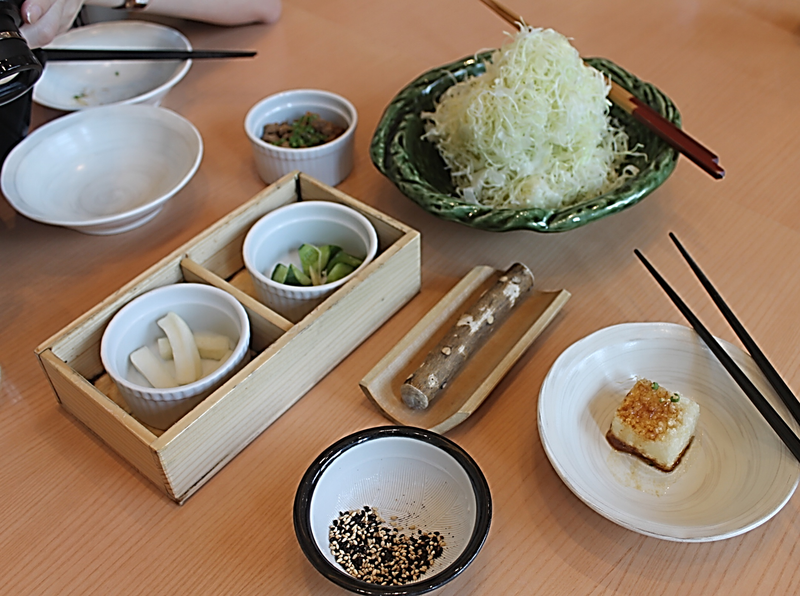 Every set comes with an unlimited serving of finely shredded cabbage and available crunchy veggies. 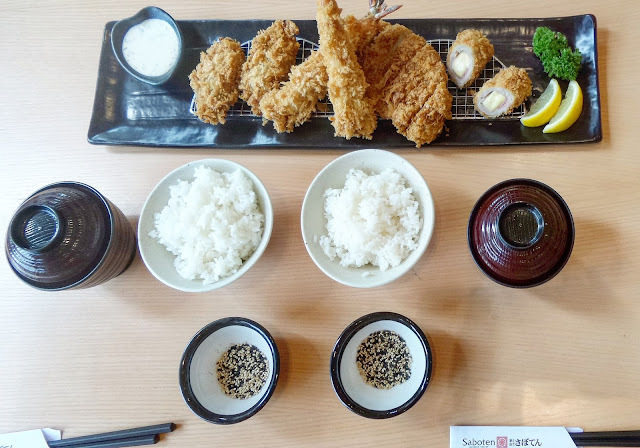 What makes Katsu-dining especial is the traditional way of preparing your own sauce or dip. 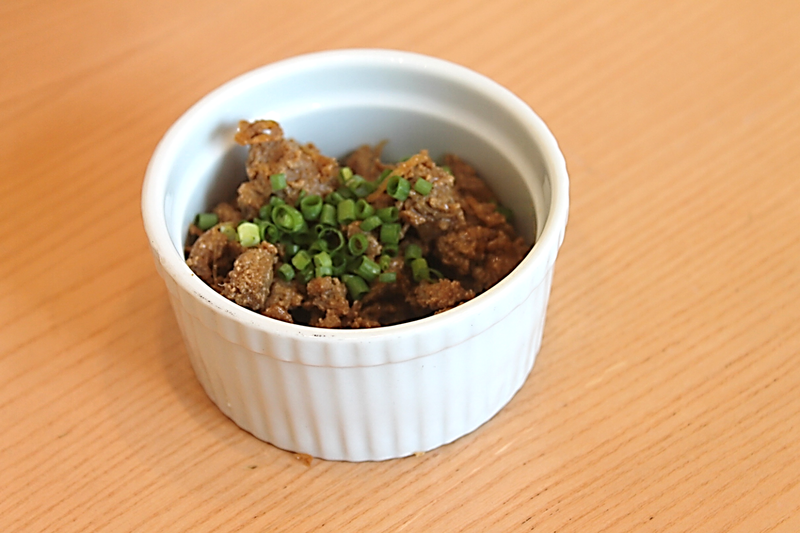 You can use with your veggies and katsu or pour on over your steamed rice. 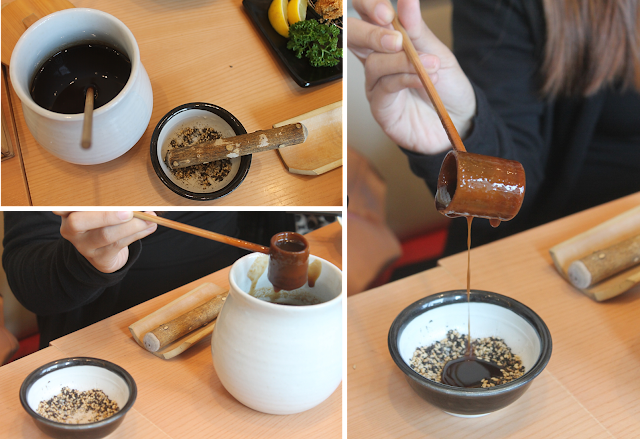 A sweet thickened dark brown sauce based probably on ponsu sits right on side of the table together with other sauces. A set that's good for two has a dish that contains sesame seeds which needed to be pounded with a bark then mixed with the sauce. Saboten's Signature Pork Tenderloin Set. 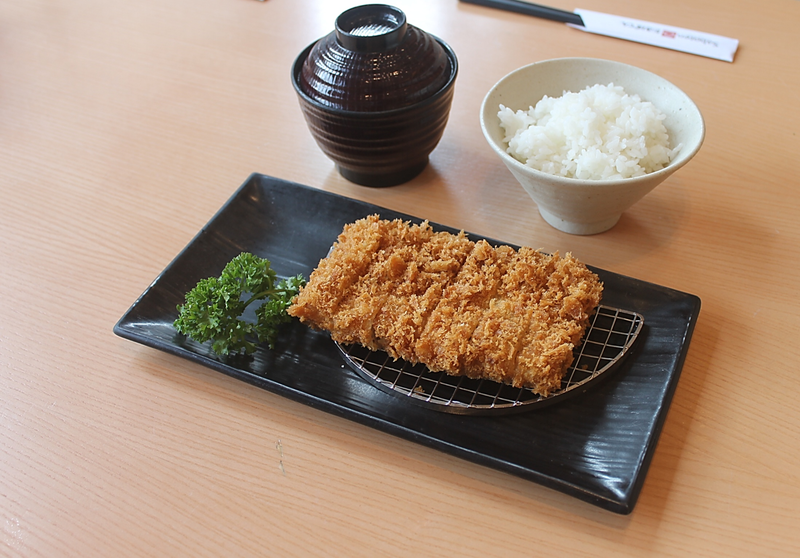 This huge serving of Pork Tenderloin Tonkatsu can serve up to two, but it's a must that you work up an appetite before coming here. What I like about Raintree is that they love their diners, and kids definitely are welcome at any Raintree restaurants. So to show more love, KIDS EAT 4 FREE vouchers will be given away to every diner who spends at least P 1000, which can be used on your next visit to any Raintree restaurants. Here is what your child can get in exchange for a KIDS EAT FOR FREE voucher- Chicken cutlets, rice, French fries, soup and a drink. Moms like me can delight seeing their little ones enjoy a treat while munching on authentic Japanese katsus. Saboten has prepared a Kiddie Set (P 275) with the cutest plate evah! The nicely plated Kiddie Set has one Tenderloin cutlet, one crab cream croquette, French fries, rice and orange juice. Saboten is more than a katsu place, apart from the cool beverages and katsu sets, their dessert line up is something to look forward to as well. There is indeed a silver lining at the end of every storm...Gosh, I think I was seeing silver lines on top of this beautiful Chocolate Hazelnut Cream Cake. Truly Nutella (choco-hazelnut spread) in taste. 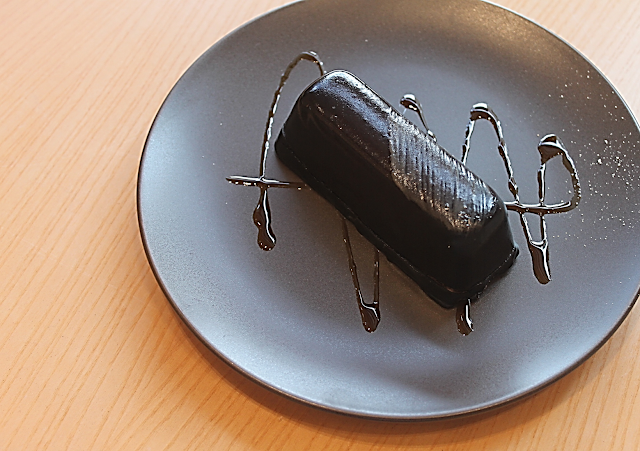 A milky chocolate flourless-cake is cloaked with a hardened dark chocolate cake and embellished with silver powder and syrup. 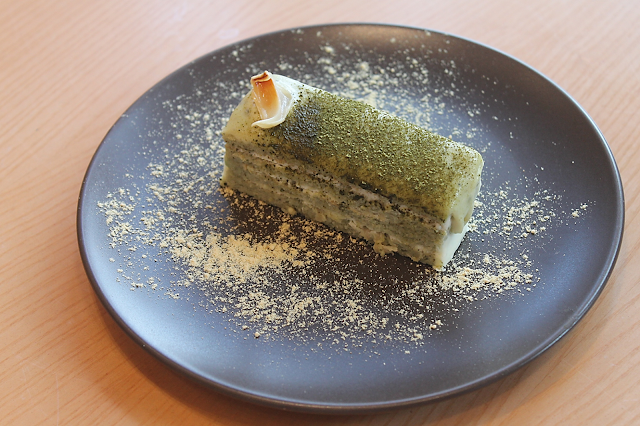 Matcha Lychee Almond Cake is an intermingling of different flavors. It's a layer of almond cake, gLychee cream and dashed with matcha green tea for an extreme punch. 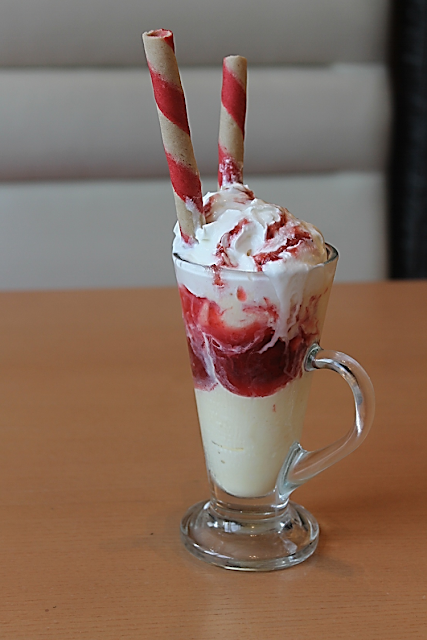 Strawberry Parfait spells summer. This stunner is just as beautiful inside and out. You can't go wrong with vanilla ice cream and strawberry preserve.